Whilst Exeter Cathedral is a vast building that’s sheer size impresses both children and adults alike. Scattered about the vast church are lots of small things to spot that are sure to keep younger visitors entertained and interested. 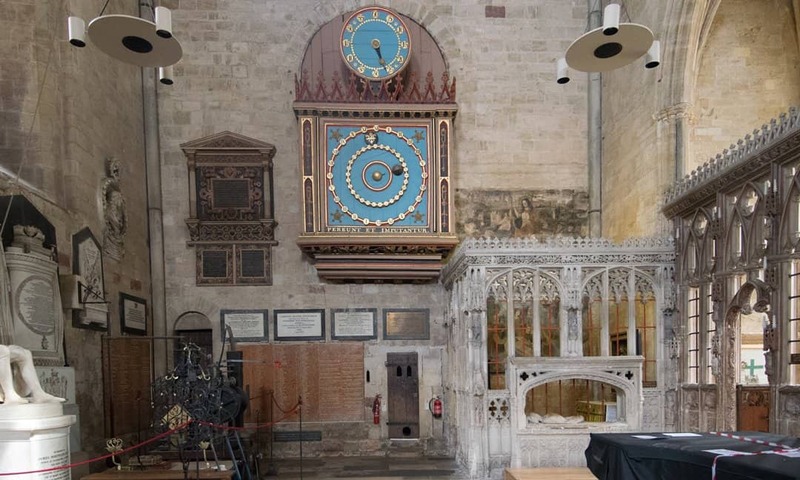 Exeter Cathedral might seem like an unusual place to look for wildlife, but take a closer look around you and you’ll see that this building is home to a whole host of animals, from owls to elephants. This is mainly because in Medieval times, when the Cathedral was originally built, lots of different craftsmen worked on the building at once, and they often copied things they saw in nature. 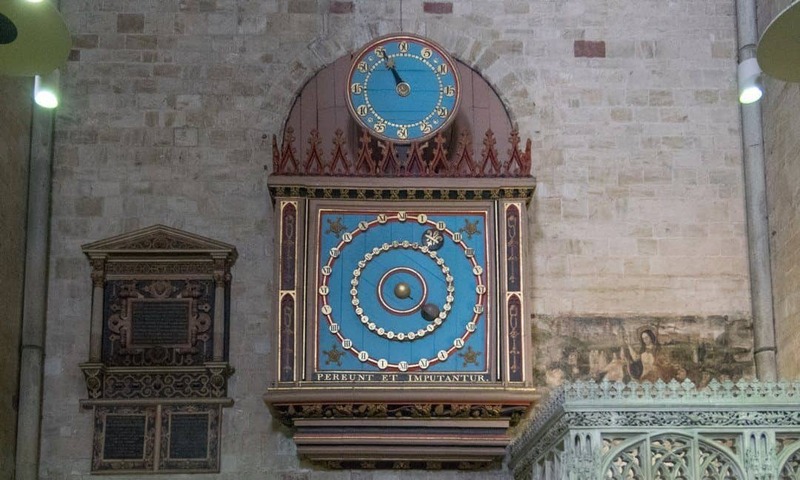 One of the things you might notice first is the big blue astronomical clock in one of the Norman towers. It was made and painted in the 15th century. However, if you take a look underneath it you might spot a doorway with a small circular hole in it. Do you have any idea what this might be for? When the clock was made it needed to be covered in animal fat to work properly, and little mice would be attracted to the smell. So in the 17th Century, somebody made a hole in the doorway so the cat could come in and out and chase the mice away. Of course, though cats catch mice, can you remember which animal is famously afraid of them? Take a look at the outside of the quire (the big wooden structure in the centre of the Cathedral) and you might notice a wooden block under glass with a carving of an elephant on it. 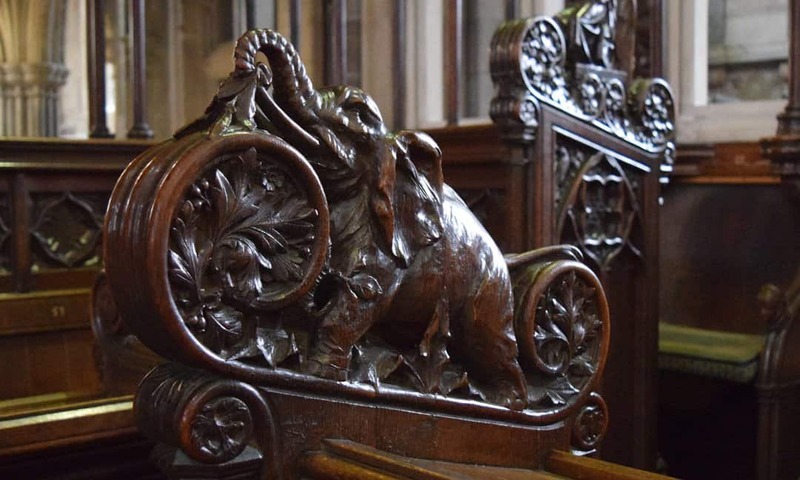 Once, this elephant could be found in the quire as a carving under one of the seats. In medieval times lots of quire stall seats were decorated with pictures of animals and other things. These carvings were known as misericords. Its feet may look a little funny, but it’s a very difficult animal to carve out of wood- especially when you haven’t seen many pictures of one! In the 13th Century, when this was made, there weren’t any zoos in the UK, so most people in England had never seen an elephant. The artist who made this might have seen one once, because an elephant was given to King Henry III in 1253. In a notebook of someone who was there, there is a drawing that looks very similar to the elephant here. Perhaps when you go home you can see if you can draw a more realistic looking elephant! For inspiration, go into the quire. Look at the seats, this is where the choir sits. Notice the carved birds and animals. Can you find the lion, a whale, and even a crocodile. If you look carefully you will find a carving of an elephant, that looks a bit more realistic than the one you have just been looking at. While elephants weren’t seen very often in Medieval England, owls have been common in the country for a very long time. You might even have seen a barn owl flying at night! However, whilst we rarely see owls because they are nocturnal, visit Bishop Oldham’s chapel and you’ll see that is covered with owls! 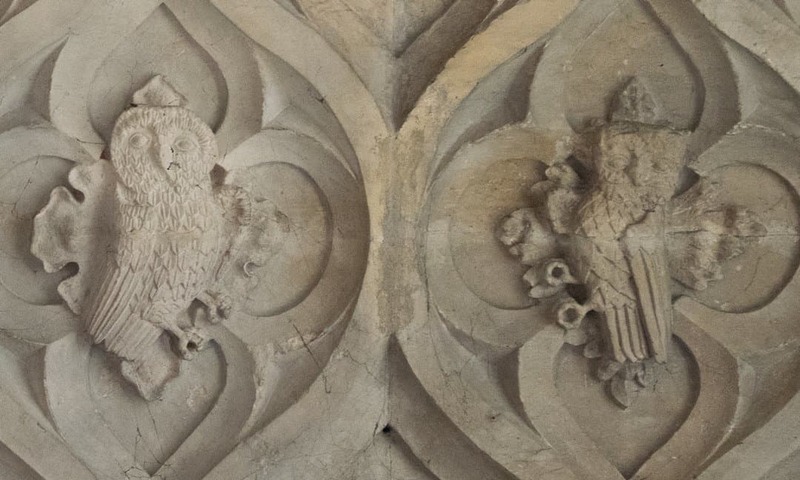 Often an owl is a symbol of wisdom, but they have been carved in this chapel because they are supposed to be a play on Bishop Oldham’s name. Take a look at the prayer mats, the ceiling and the walls- how many owls can you spot? For a short time in 2016 the green around Exeter Cathedral was home to a real Eagle Owl that had probably escaped from its owner in Plymouth. These little stone carvings are a lot quieter though! You might also notice that each of the owls looks a little different. This is because whilst most builders today have to follow what the designer says, years ago craftsmen had more freedom to choose what they wanted to carve. This means medieval buildings like the cathedral (which are also known as Gothic buildings) are special because nearly every carving looks different. Now take a look on the right side of the building and see if you can find the tomb of the Earl of Devon. Below the feet of his wife Margaret, you will see two birds. These are swans, and they were the symbol of loyalty in marriage. Under the feet of her husband, the Earl of Devon, you will see a carving of a lion. In fact many of the men in other tombs around the cathedral also have lions under their feet. For these people lions were a symbol of strength and nobility. You may also a few tombs where the man’s feet rest on a dog; this is because dogs were a symbol of loyalty. Look out for them as you go around the Cathedral! Not all the animals in the Cathedral are carvings though. In the nave (the central part) of the Cathedral, you might spot a sculpture of an eagle. This eagle is special because it holds the bible during services, and is known as a lectern. There is another animal you should really watch out for! Did you know that the Cathedral is home to a special type of spider? They are called tube web or cellar spiders, and were first spotted in 1890, towards the end of the Victorian Era. They can grow to about 22mm long, and have green fangs! Perhaps this is something you would rather not see than look out for though! As you go round the Cathedral, you may notice more animals. When looking at the elephant you might have noticed the lion in the quire. What other animals have you spotted? See how many you can spot – some might not even be in this list! If you find one, leave a comment below and tell us what animal you found and where it is located. Or just tell us how much you enjoyed your visit, and what you liked the most. Astronomical – this normally means something to do with the planets and stars. Gothic – the style most buildings in Europe were made in during the Middle Ages. Lectern – a special hold for the Bible during services, often shaped like an Eagle. Medieval or ‘Middle Ages’ – usually the 5th to the 15th Century. 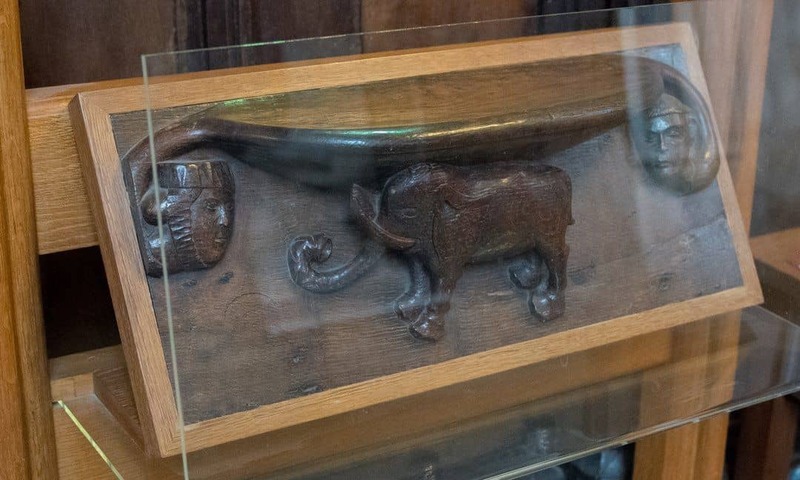 Misericords – this strange word means the carvings under the quire stall seats. Nave – the middle part of the Cathedral (some people call this the ‘aisle’- but this is actually not right!) Nocturnal – an animal that sleeps in the day and wakes at night. Norman – someone or something from Normandy. When William of Normandy became King of England in 1066, lots of buildings were built in the Norman style. Quire – the big wooden structure at the centre of the Cathedral where the clergy and church choir sit. Victorian Era – the time when Queen Victoria was on the throne, from 1837- 1901. 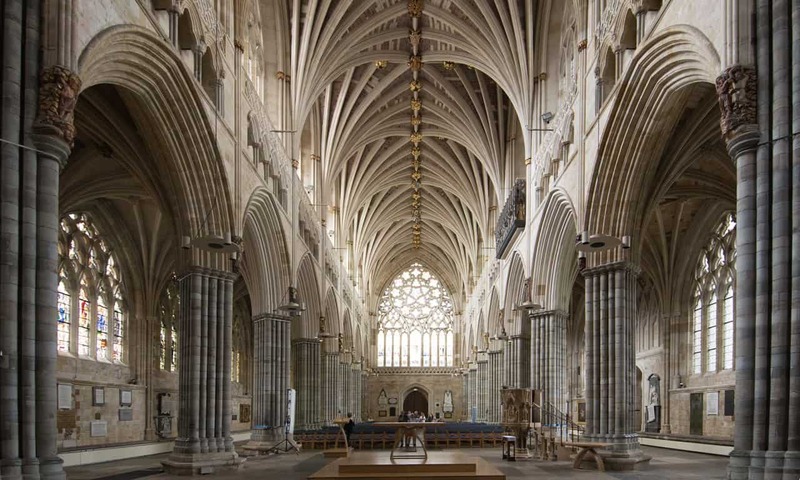 Exeter Cathedral is usually open throughout the year, follow the link for more information about visiting the cathedral and what to see and what not to miss. Schools can also contact the Cathedral to arrange a more tailored visit. I am a history enthusiast and heritage volunteer, with interests ranging from Gothic architecture to nineteenth-century painting. I love learning and writing about the world around me, and recently completed a degree in Art History and English Literature at the University of Exeter. When I haven’t got my nose in a book, I’m usually doodling, and I am currently working on a series of drawings of Victorian women.